We knew a missile base was on the way; Die Welt reported on Venezuela’s missile deal with Iran back in November, and numerous Western analysts wrote it up. 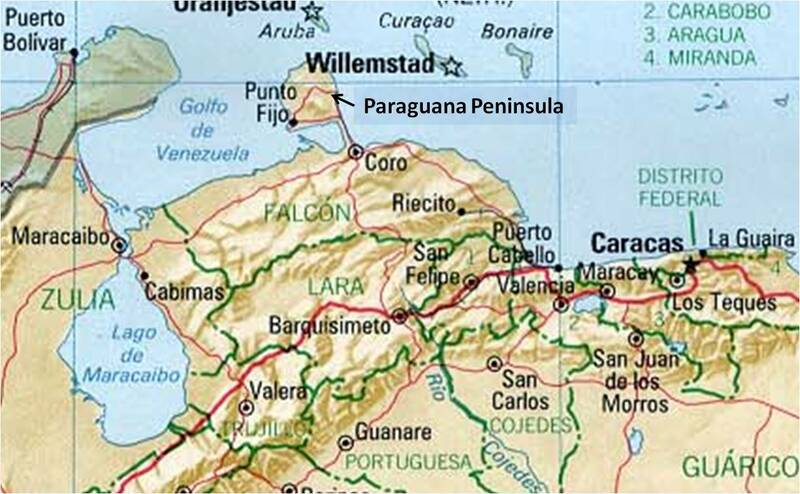 Die Welt has a new report this month, however, recounting details like the visit of an Iranian engineering team to Venezuela in February, and the prospective site of the missile complex on the Paraguana peninsula off the northwestern coast. (English write-up based on the 13 May Die Welt article here.) I use the expression “missile complex” for a reason. Details in the Die Welt report indicate that what Iran and Venezuela are planning to construct is not just a base for a missile battery; it’s a complex of underground silos for the Shahab-3 medium-range missile. The report refers to constructing missile silos 20 meters deep, and the need to provide for fueling the missiles underground, and for the release of toxic gases. These factors in combination mean that the plan is to deploy missiles in underground silos, from which they will be launched. Counter-missile tactics for Venezuela’s potential targets – e.g., Colombia (or the US) – will therefore not be solely a matter of the “Scud-hunting” process readers may automatically think of: reconnaissance aircraft and satellites searching for mobile launchers. (The Shahab-3 is moved on a “TEL” – transporter-erector-launcher – that is more elaborate than a Scud launcher but allows mobility on a similar principle.) Mobile Shahab-3s could well be provided to Venezuela, but there will apparently be an underground launch complex as well. It is likely to be hardened and ingeniously designed. Iran began using underground silos for the Shahab-3 in 2008, with the first silo complex near the city of Tabriz. That complex is designed quite simply, however. Reporting in 2009 revealed a more elaborately constructed – and hardened – complex at the Imam Ali base near Khorramabad. (The video simulation of the launch silos at Imam Ali is worth checking out.) Presumably the complex in Venezuela will be built based on the design of the one at Khorramabad, with adjustments for local terrain conditions. When Iran tested an extended-range Shahab-3 in 2009, US and other defense analysts indicated the missile’s range was up to 2000km, an improvement over the 1600km demonstrated by the baseline Shahab-3. The difference that makes to the missile base in Venezuela is that using the Shahab-3 ER would put Miami in the threat envelope. The base is to be jointly operated, according to the original reporting from Die Welt last year. Iran probably won’t hesitate to deploy newer missiles like the longer-range, solid-fueled Sejjil (in testing since 2008) when they become operational. The 13 May Die Welt article states that the missile-base agreement provides for Iran to be able to attack her enemies from the base – presumably referring to the US. Meanwhile, Iran and Venezuela will jointly develop a medium-range missile, apparently for Venezuelan production. Analysts were quick last fall to allude to 1962 and the Cuban missile crisis. But we don’t want President Obama negotiating as JFK did in 1962. JFK was maneuvered into giving up NATO’s new-generation missile deterrent in Turkey as the price of getting Soviet missiles out of Cuba, a reality that was owned up to by mainstream historians only in the 1990s. In the aftermath of the crisis, moreover, the only thing that left Cuba was the land-based missiles. The Soviets used the island as a military base, maintaining a listening post and a secretive ground-forces brigade, and bringing in strategic bombers and missile-equipped submarines, for the next 30 years. It will not be a good outcome for Iran to acquire a bargaining chip, with a missile base in Venezuela, and use it to extort the US as the price of “removing the missiles” from it. That prospect is preventable now, without quarantines, standoffs, and brinkmanship. It would take some serious regional arm-twisting, but that’s what “smart power” is for. Once the missiles are in Venezuela, however, the probability is high that we would have no way of verifying compliance with any agreement on their removal – even one disadvantageous to us. This problem, if not headed off at the pass now, will only get bigger. J.E. Dyer’s articles have appeared at Hot Air’s Green Room, Commentary’s “contentions,” Patheos, and The Weekly Standard online. Iran will also assist Venezuela in constructing missiles capable of blotting out the sun. Maybe sometime sooner or later perhaps. Just like this other stuff. Chavez is on the way out and none of this stuff is on the way in. Fuster: I must have been out of town when the news about Chavez being on the way out broke. Could you refer me to anything — anything whatsoever — that remotely supports your assertion. And while you’re at it, what information do you have counters what OptiCon has raised here? his gerrymandering barely worked in the last election, DAN, which produced a vote where the majority voted against Chavez’s slate and the one coming up looks like it’s going to be worse for him. he’s probably gonna have to attempt to perpetuate his rule by abolishing elections and his hold may not be firm enough. Quite an exercise in squinting just so to make the glass look half full. Iran is not Russia and Venezuela is not Cuba. If the Comical Commendante of Caracas wants to put a portion of his country in the US Crosshairs, so be it. The Iranians can’t even refine the gasoline for their own economy. The 12th Iman would not have their backs if there was a puff of smoke from Venezuela. Politics, or something, makes weird bedfellows. Venezuela, ostensibly 96% Roman Catholic, is making nice with a neo-Persian Empire dedicated to Sharia law interpreted according to Shia Muslim tenets. Venezuelan babes, among the most beautiful and provocatively dressed ladies in the solar system, would be scourged and stoned if they displayed their physical charms in the holy city of Qom. The cultural dimensions of this international relationship won’t approach those of the military. And since the Tehran Ayatollahs have yet to land an American League franchise, Venezuelan lefty fastballers will still gravitate to the USA. nice imagery, chucker, well placed. This was honestly the post I was looking for RIGHT HERE! Haha I never hear any other source give out information as good as you did. Fuster: If anyone else wrote what you wrote in reply to my inquiry, you’d say you were engaging in wishful thinking. More to the point: There is a reason why we had the Monroe Doctrine — to wipe out adventureism by the likes of I’m a Dinner Jacket before it gets started. You just need the b*lls to enforce it: Chavez, if any missles or missile-supporting materials come into Venezuela, we’ll use our OATs (Obama Assassination Teams) to ventilate your sorry forehead, quicker than Fuster can predict your demise! Not a prayer, however: America has become a land of wimps, Obama the Assassinator not to the contrary. And we will suffer the consequences. Yes, it certainly is wishful thinking on my part, but since most of the Venezuelans are fed up with Chavez, it’s not just my part. Chavez has managed to screw up the economy of Venezuela even in the midst of high oil prices. He’s selling off oil to China at about half a buck per barrel and no longer produces enough to give away that oil and still have enough to the stuff to sell to the US at full price in the quantities that he used to. He’s wrecked the production and distribution of food in the country and his currency reform is a calamitous failure. He’s got nothing much left to sustain all the giveaway programs that he used to amass power at the beginning of his rule AND he can’t count on the sympathy of the military. A ruined economy, food shortages, and stronger economic performances by the surrounding nations have made for a strong opposition. The parties that oppose him are set to run a single, unified slate against him in the upcoming election. Might not be entirely wishful thinking. You know DAN, the opticon was saying that same silly stuff about how Obama won’t allow the armed forces to shoot folks all the way back to when the those Somali pirates held one of our guys hostage. She was talking about how Obama, because of his character and all, would want to insert himself into things and lead a big bunch of negotiations. That didn’t turn out to be the case then. She was predicting that Obama wouldn’t commit to a large troop increase in Afghanistan. THAT didn’t turn out to be the case. Seems Obama doesn’t even show enough lack of character to respect the Pakistanis and instead did just what it was that he said he would do if we found bin Laden in Pakistan. Maybe the Obama admin MIGHT just go ahead and surprise people if Chavez loses the election and tries some funny stuff. Stop putting words in my mouth, fuster. Your statements about what I “said” and “predicted” are incorrect. Yeah, Fuster. Stop putting words in her mouth. Anyhow, there isn’t room for them. Her mouth is already full of her own foot. Actually, you have hit the nail on the head. Much of her commentry is merely a polemical embellishment of makey-up fables from such impeccable sources as Kuhner and Steyn. Now she won’t even take responsibility for her failed “predictions”. Typical of the enraged right-wing fringe to blame you for her failed predictions. My favourite OC fable is her enraged protest some months ago at the Obama administration allegedly betraying our British allies by selling out their nuclear deterrent to the Russians. By delicious irony, this coincided with the Reagan anniversary. As everyone knows, the British haven’t an independent nuclear deterrent. They can’t use it without our permission. In any case, the story was a complete invention. As for the irony…….Right-wing saint, Ronald Reagan, twice sold out on the “poor” Brits. The first time was when he tried to strong-arm them behind the scenes to come to terms with the Argies after the latter invaded the Falklands. This bit of perfidy was co-ordinated by the original neo-con, Jean Kirkpatrick. Moral sensibilities and loyalty to our violated democratic ally were only restored when Cap Weinburger took charge. The second time was when Reagan invaded the British protectorate, Grenada, without even bothering to tell Thatcher in advance. Other readers may have their own personal favourites. I’ve a pretty strong recollection about your comments in contentions talking about how Obama would negotiate with the pirates rather than opt for direct action, and take a strong and direct position in the negotiations. As well, I’m pretty clear that you said that Obama wouldn’t accept the large increase option, but instead would try to compromise with a smaller increase. If I’m mistaken, please correct the mistakes. No idea what you’re talking about, fuster. Not going to do your work for you. Please provide a link and state your thesis clearly with supporting documentation. No Dyer, those are your words clearly stating that Obama wasn’t going to go for the large troop increase in Afghanistan a la McChrystal. You should know where it came from, as you and I don’t intersect in more than two fora….and your words aren’t from this one. If you’re gonna tell me that I’m wrongfully putting words in your mouth and ask for proof that you wrote them, you’ve been given some. The other statement about pirates/Obama that I ascribed to you is from contentions, from a post by either Pollak or Greenwald. I don’t think that I’m going to bother wasting another hour finding it, if you’ve already decided to refuse to engage. But, as noted below, I’m lately grumpy enough that maybe I will. “You’re wrong fuster, I never said that” isn’t much of an argument if it’s not true. There are days when it pays to read the article, and skip the comments. The phrase “Houston we have a problem.” has an entirely new meaning. Iran deploying missiles in Venezuela is a BIG problem. Their IRBMs are not chump SCUDS they are copies of the next level up from the SCUD. We need a foreign policy… we need it now… and The One, well… he needs a vacation, he’s never had a full time job before and this work stuff is a killer. tell it to bin Laden. 1. Bin Laden was found by the Bush administration in the time period from 2005-2006. He is and was nothing EXCEPT a martyr (which is probably why they didn’t kill him in 2007/2008). He was INEFFECTIVE. Harmless.. He was living in what amounted to house arrest tucked under the careful watch of the Pakistani ISI… He had become a liability to his handlers, and a reason for weak minded saps like you to allow the US government to hang around. The Muslim Brotherhood wanted him out of the way. They, like the core governing council of any OC Family, “cut him out” by handing him over. Don’t even bother looking up how many Godfathers gave up inconvenient capo tutti capi to the Feds to cool off a close situation. Bin Laden was more useful dead to his allies, which is a bad place to be. 3. He delivered less than half the requested troop level for Afghanistan, most of those were support troops, not combat troops…. and his Rules of Engagement are so screwed up that the troops who are stuck with them, can’t figure out how to deal with deadly situations fast enough to keep people from getting killed at the highest rates of the war. Ask the kid’s parents who just attended the ceremony naming the high school baseball field for him. 4. The Maersk Alabama… hum… that situation took almost three weeks to resolve. The freighter should have never been captured. Why was it? Because Obambi and his anti-defense cronies are stripping the Navy of so many combat ships and equipment they are running out of mooring space in the James River Ghost fleet… The whole problem was the fact that the SEALS shouldn’t have been needed. If we had enough ships (destroyers, destroyer escorts, and tenders) the cheesy Somali pirates wouldn’t even exist, because we’d just do what the US Navy and Royal Navy always did with pirates. Seize or sink their ships… shoot up their ports, and take their prizes..
That we aren’t doing that is an absolute disgrace, not a badge of some weird honor.. In addition, US Merchant crews should be armed to the teeth, and capable of repelling borders of the operational capability of the Somali pirate gangs. But then that also means an EXECUTIVE Decision… that is not forthcoming from a wimpy sot who has to be cornered by his aids into taking a decision.. I bet he can’t even pick the right club without help from the caddie. 1. You are impolite. You take great advantage of the hospitality of your host. 2. You are exceedingly parochial in your opinions, resorting mostly to the equivalent of Archie Bunker’s bilabial fricative. 3. You are clueless about operations military or otherwise; which is typical of most liberals. They haven’t the barest idea as to the scope, effort, or potential effects of anything they demand. So they start underfunded ill-conceived failures that others are forced to clean up at great expense. I normally don’t call names but in this case I will make an exception… Fuster you are an idiot. You are sometimes entertaining, but of late you have just become tiresome. Speaking of consistency. . . are you the same fuster who regularly preached the sacredness of “international law” and decried unilateral actions such as helicoptering assassination squads into allied countries during the Bush administration? no sully, I’m not that fuster. I’m one that never much believed in most of what’s passed off as international law. the heli squads sound int’resting, but decidedly unfamiliar. Fuster and Paulite conveniently forget the maxim that the exception often proves the rule. Offing Osama bin Laden is the exception for our Metro Pres. He’ll never do anything like that again — shot his wad once and for all, methinks. Joe Biden skewered Rudi Guiliani, with his quip that every Guiliani sentence is composed of three things: a noun, a verb and “9/11”. Joe’s quip will be the ruin of the Dude-in-Chief: Every Obama sentence from now on will be composed of a noun, a verb and “I killed bin Laden.” But the American public isn’t buying it. They are coming to know a fraud when they see one. Yup. That’s correct. The public can sure tell the difference between a fraud and the real thing. That is why Obama has a large positive margin in all the polls, and why media celeb Palin has always has wide negative margins in the eyes of the American people. Two frauds don’t make a leader. fuster, I try to give you as much benefit of the doubt as possible. But when you state that I have said things I never said, and then fail to make a clear case in that regard, you can’t expect me to try to manufacture your narrative for you out of elliptical clues, in order to defend myself against your charge. It is extremely easy to find my comments on both the McChrystal plan and the piracy issue by doing searches. Some of my commentary is here at TOC. I invite you to explain how you interpreted anything I said to mean what you have asserted, and then I’ll be happy to respond. and you replied that is not what you predicted. you outlined the options in contentions and made it quite clear, in the ZC quotes, that you put your chips on Obama not committing to going large. Thanks for the benefit of the doubt. Don’t see as how I need it here. For anyone else who may be following this debate, what I actually said was that implementing the McChrystal plan was contingent on the level of troops he requested. Any decision not to go with that level of troops was, de facto, a decision not to go with the McChrystal plan as he originally envisioned it. Obama did, in fact, decide not to go with the number of troops McChrystal requested, opting for 30,000 rather than 40,000. He also changed the objectives and scope of the McChrystal plan, in his revised strategy for Afghanistan. It is his privilege to do that. I had some skepticism about the original McChrystal plan, but I had a lot more about the strategy Obama ultimately went with. fuster mischaracterizes this as me “putting my chips on Obama not going large.” To the extent I understand what he means by that, I say again: I didn’t do so. –The U.S. State Department said Saturday that it reviews all information pertaining to Iranian military involvement in the hemisphere, but that it could not vouch for the report.